A veteran NASA astronaut who will soon become the American record holder for most days in space is an outspoken professing Christian who believes that scientific research confirms the Bible’s creation account. Jeff Williams is a 58-year-old astronaut with a decorated career at NASA spanning two decades. According to his online biography, he served as a flight engineer on a space shuttle flight in 2000, helping deliver and install over 5,000 pounds of equipment and supplies for the development and construction of the International Space Station (ISS). 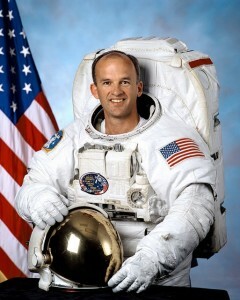 In both 2006 and 2009-10, Williams served six-month tours of duty on the ISS. On Friday, Williams—along with two Russian cosmonauts—launched into space for another six-month mission at the ISS. This most recent space flight, Williams’s fourth, will be historic. “Williams is now the first American to become a three-time, long-term resident of the International Space Station,” NASA noted. Early on Saturday, Williams posted pictures of his expedition’s launch on Twitter. “It is great to be back on board @Space_Station, an amazing orbital outpost!” he wrote. Williams is not only an accomplished astronaut; he is also outspoken about his profession of the Christian faith. In 2010, he wrote a book entitled “The Work of His Hands,” which showcased vivid photographs he took while on board the ISS in 2009-2010, along with numerous Bible verses. Williams says there is no conflict between his Christianity and his work for NASA. “There is a generalization that anyone who worked for NASA, or an organization like that, would naturally be an atheist, but that’s not true,” he told the Institute for Creation Research in an interview last year. Likewise, there is no conflict between the Bible and honest science, Williams says.